I’m helping a friend with MS liquidate her extensive collection of antique clothing and accessories so keep checking for more items as I will be adding all the time. This 1880s bustle dress is elegant in its simplicity. 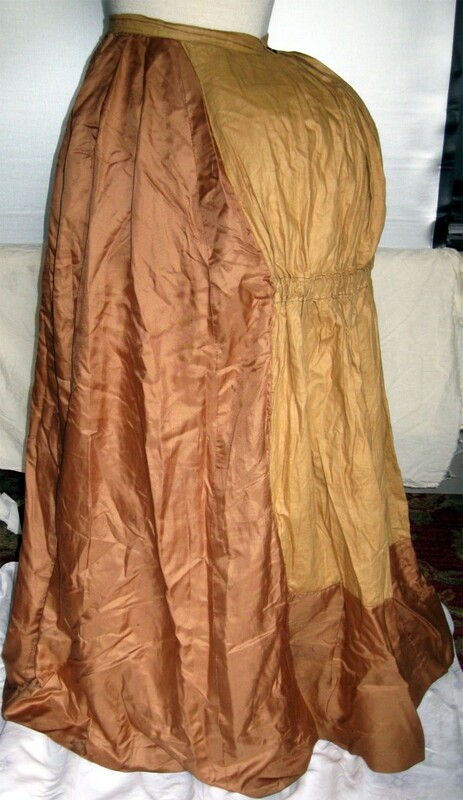 Made of tobacco brown soft twilled silk, it is accented with a cream twilled silk center front insert that is lightly gathered in rows at the top and pleated at the bottom. It is topped with a high standing collar of the same cream silk. 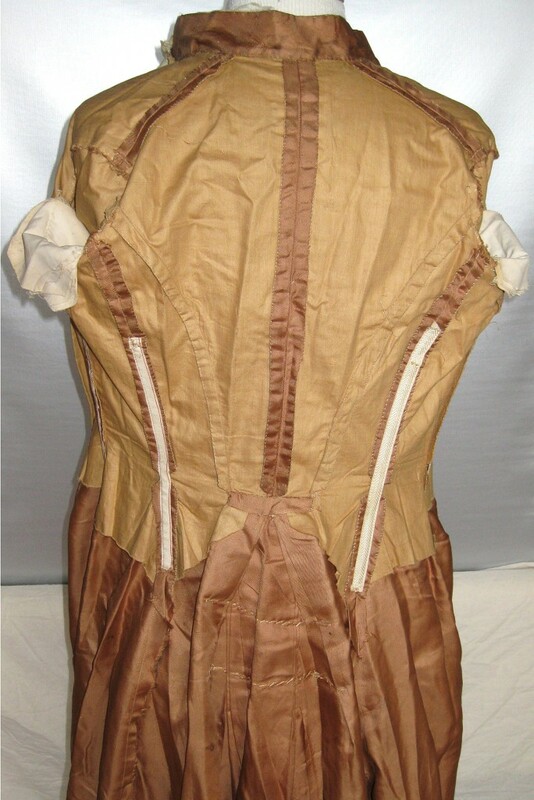 The bodice opens to the left side of the insertion with the brown twilled cotton lining fastened with bone buttons. 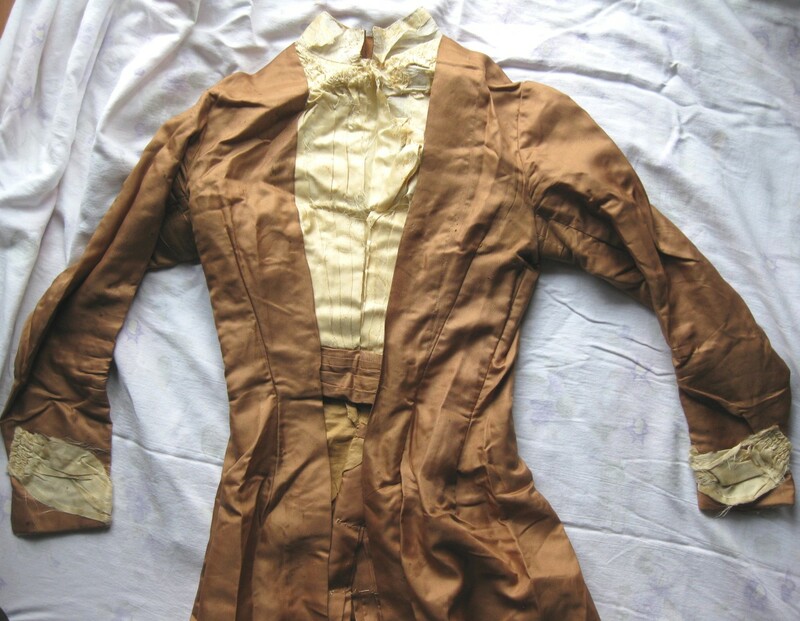 The cream insertion, lined with a stiffened white twilled fabric, fastens with hooks and eyes under the overlapping edge of the brown dress fabric. The cream silk trim is repeated at the wrists with only the rows of gathers on one end but no pleats. Long darts and curved seams extend past the waist into the open front overskirt. Long bones inserted in the front darts and side and side back seams create a smooth line over the hips. Shorter bones are inserted either side of the cream insertion. 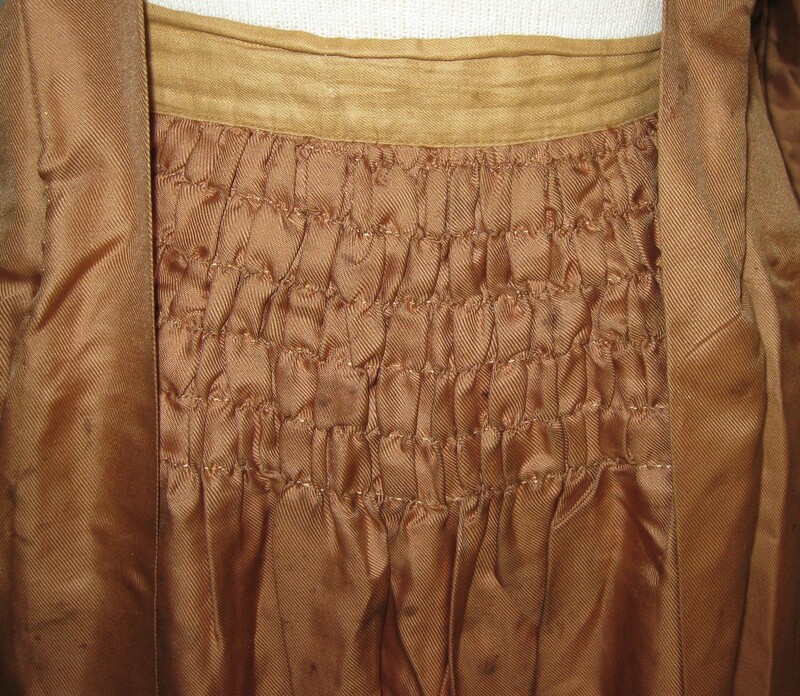 A horizontal brown pleated band just below the bodice insert hides the waistband of the separate underskirt. The center back of the overskirt has five stacked pleats either side of the center back. They are fanned out slightly near the top and lightly tacked down on the inside to spread out gracefully over the bustle worn underneath. The underskirt has six rows of horizontal gathers at the top where it shows below the bodice. The front and lower portion of the back of the underskirt is made of the same soft twilled silk as the bodice and overskirt with the hidden upper back portion made of equally lightweight brown twilled cotton. A a 15 inch (38 cm) long flexible band is inserted and gathered into the back of the underskirt 13.5 inches (34 cm) below the waist band to support and continue the shape created by the bustle worn above it. It was only after the photos were taken that I discovered the (stretched out) elastic straps and delicate buckle inside to bow the band out as far as desired. The underskirt has two knife pleats either side of the center gathers then has six stacked knife pleats either side of the back fastening for the fullness needed to go over the bustle. It fastens with one horn or dyed bone button. The silk portion of the underskirt is lined with plain weave tan cotton edged on the outside bottom 2 inches (5 cm) with the dress silk. The lining also has a hem facing of stiff darker brown fabric 5.25 inches (13.5 cm) deep with tan wool hem braid sandwiched between it and the lining so it extends down about a half an inch. Condition: Underskirt: It is in sound condition if wrinkled from storage. There are small soiled spots scattered over the front and wear stains around the hem area. The hem braid is damaged or missing in some sections. Bodice and overskirt: Like the underskirt, the dress fabric is sound but wrinkled and also has small brown scattered soiled spots. Unfortunately, the cream silk fabric did not hold up nearly as well as the brown. It is badly shattered or shredding in most places. Please note: The bustle is Not included in this auction. THANK YOU!!!! Thankyouthankyouthankyou, for your wonderful pictures. Not only does she take photos of the outside of the dress on a good display, but she took photos of the insides too! Yay!